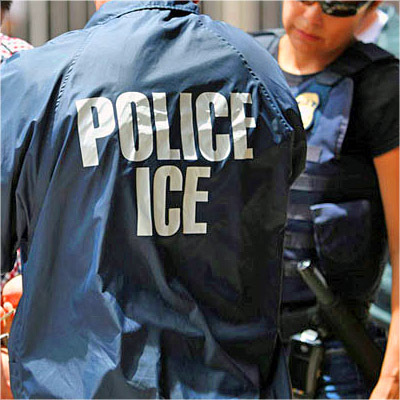 HOUSTON (CN) – Immigration and Customs Enforcement agents arrested 95 undocumented immigrants in Houston and surrounding counties last week, fulfilling its new mandate to crack down on all immigrants with criminal records, the agency said Monday. Galvanized by President Donald Trump’s call for it to aggressively pursue unauthorized immigrants, ICE said in a statement the four-day roundup in southeast Texas that ended Friday was another “targeted enforcement action” that its “fugitive operation teams” are doing every day throughout the country. U.S. Attorney General Jeff Sessions says the administration’s top priority is deporting criminals and the Houston arrests back that claim. ICE said all 95 people it arrested had criminal convictions, some for homicide, aggravated assault and child abuse. “Individuals arrested during this operation are from the following countries: Cambodia (1), Cuba (1), El Salvador (8), Guatemala (3), Honduras (11), Mexico (66), Nicaragua (2), Nigeria (1) and Vietnam (2),” the agency said. Others had drug possession and DUI convictions, typically misdemeanor offenses. Despite the Trump administration’s focus on immigrants with criminal records, critics say Trump’s policies are also catching people whose only crime is being in the country illegally in ICE’s dragnet. “During the targeted enforcement operations, ICE officers frequently encounter other aliens illegally present in the United States. They are evaluated on a case-by-case basis, and, when appropriate, they are arrested by ICE officers,” ICE said in a statement about the Houston-area arrests. ICE only gave details about five of the arrests. Most notably, it said its agents arrested a 55-year-old Salvadoran man convicted of manslaughter who was deported in April 1987; a 32-year-old Mexican gang member with marijuana possession, evading arrest and gun possession convictions on his record, who was deported in 2006; and a 25-year-old Mexican man convicted of exposing himself to a child. All three men were arrested in Houston. ICE put Texas immigrants on edge in February when it arrested 51 unauthorized immigrants in raids in Austin and surrounding areas, many of whom had no criminal record. U.S. Magistrate Judge Andrew Austin said in open court in March that immigration officials told him the February raids were retaliation for the so-called sanctuary-city policy of Travis County Sheriff Sally Hernandez, who took office in January. Hernandez refuses to detain undocumented immigrants charged with or convicted of most crimes so ICE can pick them up. She does, however, honor ICE detainers for people charged with capital murder, first-degree murder, aggravated sexual assault or human smuggling. Texas Gov. Greg Abbott cut $1.5 million in criminal justice grants earmarked for Travis County in February after Hernandez refused to reverse the policy. The Texas Senate passed a bill targeting sanctuary cities in February. The measure, Senate Bill 4, would punish local and college campus police departments that refuse to comply with ICE detainer requests to hand over immigrants for possible deportation. Law enforcement officials could also be charged with a Class A misdemeanor, punishable by up to a year in jail, for refusing to comply with ICE detainers. The Texas Senate passed the bill in February and sent it to the Texas House. The House is considering a slightly softened version of SB 4, as a House committee early this month removed language that would have authorized police to ask anyone they detain about their immigration status, the Texas Tribune reported. Police can only ask people they arrest about their immigration status under the House revision. Though former President Barack Obama’s administration focused on deporting dangerous criminals and immigrants who had recently crossed the border, and he started a program to protect law-abiding immigrants brought to the United States as children from deportation, his legacy is mixed for immigrant advocates who point out that the Department of Homeland Security deported a record 5.2 million people on his watch. Trump is on track to contend for the “Deporter in Chief” title that immigrants-rights groups gave Obama. ICE agents arrested 21,362 immigrants from mid-January, just before Trump took office, through mid-March, the Washington Post reported. That’s nearly one-third more than the same period last year during Obama’s presidency. Arrests of immigrants with clean criminal records more than doubled to 5,441. The San Antonio office of the Refugee and Immigrant Center for Education and Legal Services didn’t immediately respond Tuesday morning to a request for comment on the Houston ICE sweep. The nonprofit doesn’t have a Houston office.